The goal of the Knowledge Discovery Metamodel (KDM specification) is to ensure interoperability between tools for maintenance, evolution, assessment and modernization. KDM is defined as a metamodel that can be also viewed as an ontology for describing the key aspects of knowledge related to the various facets of enterprise software. Support of the Knowledge Discovery Metamodel means investment into the KDM ecosystem – a growing open-standard based cohesive community of tool vendors, service providers, and commercial components. Knowledge Discovery Metamodel represents entire enterprise software systems, not just code. KDM is a wide-spectrum entity-relationship representation for describing existing software. The KDM specification represents structural and behavior elements of existing software systems. KDM is an entity-relationship model. In addition, the key concept of KDM is a container: an entity that owns other entities. This allows KDM to represent existing systems at various degrees of granularity. KDM includes a part (called Program Elements Layer), which represents information similar to that found in Abstract Syntax Tree for a particular programming language. KDM Program Elements Layer is significantly different from Abstract Syntax Trees, because KDM constructs are language-independent (in the sense that the same common meta-element is used to represent a procedure in C and in Fortran), KDM constructs are based on the entity-relationship model. Fine grained semantic information is represented as micro KDM constructs (similar to a compiler intermediate representation rather than an Abstract Syntax Tree) or as extensions to the common constructs. The main purpose of KDM is to provide a uniform representation for developing reusable, language-independent code for analyzing software assets. See Why KDM? for more details. Knowledge Discovery Metamodel defines precise semantic foundation for representing behavior, the so-called micro-KDM. It provides a high-fidelity intermediate representation which can be used, for example, for performing static analysis of existing software systems. Micro-KDM is similar in purpose to a virtual machine for the KDM, although Knowledge Discovery Metamodel is not an executable model, or a constraint model, but a representation of existing artifacts for analysis purposes. KDM facilitates incremental analysis of existing software systems, where the initial KDM representation is analyzed and more pieces of knowledge are extracted and made explicit as KDM to KDM transformation performed entirely within the KDM technology space. The steps of the knowledge extraction process can be performed by tools, and may involve the analyst. KDM is the uniform language- and platform- independent representation. Its extensibility mechanism allows addition of domain-, application- and implementation-specific knowledge. See KDM 1.0 Annotated Reference for complete description of the OMG Knowledge Discovery Metamodel 1.0 specification. 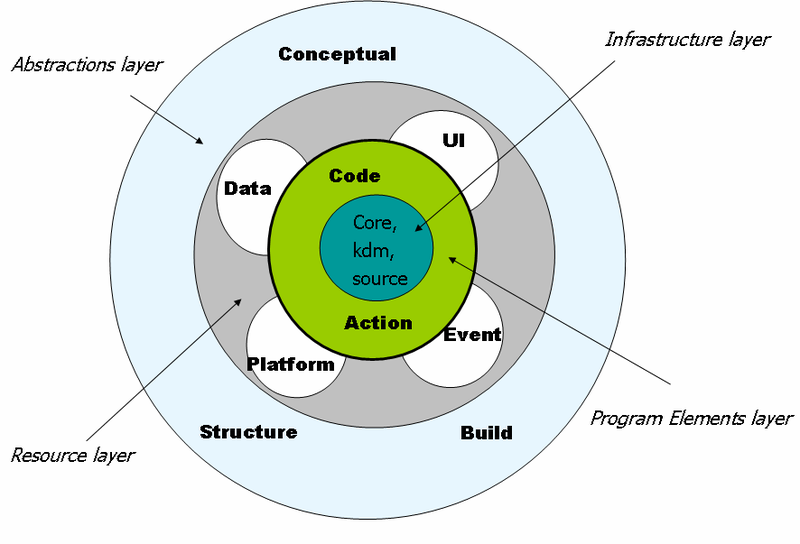 The KDM Infrastructure Layer consists of the Core, kdm, and Source packages which provide a small common core for all other packages, the inventory model of the artifacts of the existing system and full traceability between the meta-model elements as links back to the source code of the artifacts, as well as the uniform extensibility mechanism. The Core package determines several of patterns that are reused by other KDM packages. 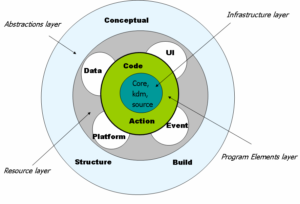 Although KDM is a meta-model that uses Meta-Object Facility, there is an alignment between the KDM Core and Resource Description Framework (RDF). The Program Elements Layer consists of the Code and Action packages. The Resource Layer represents the operational environment of the existing software system. it is related to the area of Enterprise Application Integration (EAI). It is often said that Abstract Syntax Tree is a representation of choice for analysis of software assets – after all, it faithfully represents the source code, and therefore contains all information about the software systems. In fact, this is not true for quite a large number of software analysis scenarios, because the application source code is not self-contained, since it determined by the runtime platform. The runtime platform contributes to the control flow and data flow of the application, however, it is usually not represented by the source code in the same way as the application software is. So there is no corresponding Abstract Syntax Tree. Resource Layer of KDM closes this gap by providing modeling elements (integrated into the KDM Core) to represent entities and relationships determined by the runtime platform, focusing on control and data flow provided by the platform. The Abstraction Layer represents domain and application abstractions. Access to some examples of the KDM XMI from the Knowledge Discovery Metamodel specification. Knowledge Discovery Metamodel Software Development Kit (SDK) from KDM Analytics is a “springboard” for adopting OMG Knowledge Discovery Metamodel (KDM) standard. The complete annotated reference to the Object Management Group Knowledge Discovery Metamodel KDM 1.0 specification. Copyright © 2016-19 KDM Analytics. All rights reserved.